My love for fall calls for me to design get-together’s for friends and family to enjoy in all that the changing of the leaves bring! Here are some fun and festive playdate ideas to get you in the fall spirit! 1. Organize a trip to your local pumpkin patch! These can be so fun! Usually you are able to pick out your own pumpkin, go on hayrides, and even do a corn maze! Kids are bound to have a lot of fun. Once you have chosen your pumpkin from the pumpkin patch, organize a fun day when you and your friends can get together and decorate them! Maybe even do it “potluck style” where everyone brings an item to accessorize them with…maybe paint, googly eyes, construction paper, foam, electric candles, glitter, stickers, anything you can think of! 3. 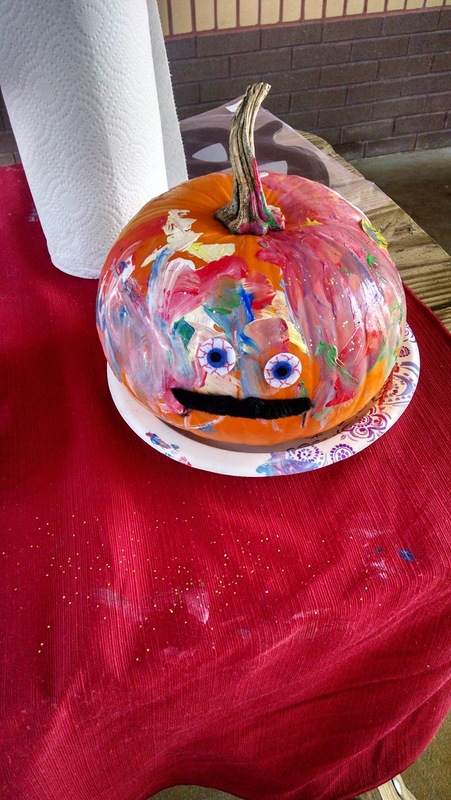 Make a scarecrow with your kids! Go to the thrift store and find some old jeans, maybe an old flannel shirt, a sweet straw hat, maybe some old work gloves. Take all of your treasures home and have your kids start stuffing the clothes with old newspaper or plastic trash bags, really anything that will give it the 3D effect! Show it off in your front yard when you are done! 4. Make some fall candy bark! We did this last year and it was really tasty! I started by going to the grocery store and finding fall colored snacks. 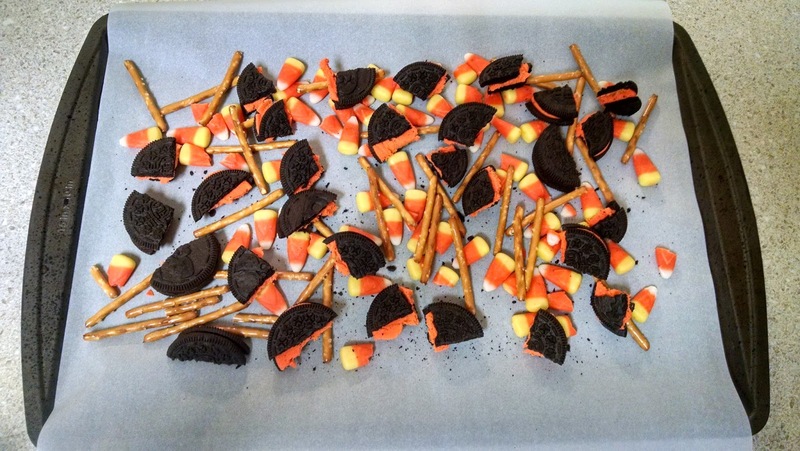 I used Halloween Oreos (with the orange cream), pretzels, candy corn, and melted white chocolate. Lay all of your dry ingredients on a cookie sheet lined with parchment paper. Break up the big pieces, like the Oreos and pretzels. Drizzle your melted white chocolate over the top making sure you cover all of the dry ingredient pieces. Put it in the refrigerator until hardened and enjoy! 5. 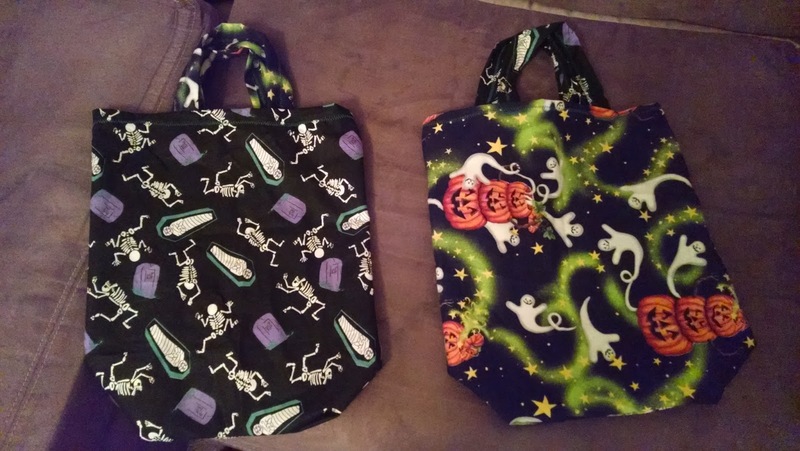 Make your own trick-or-treat bag! 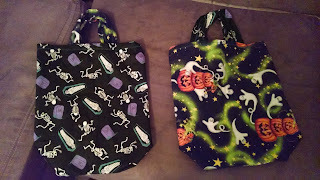 You can buy a premade plain canvas bag from your local craft store, or you can buy some fall fabric and simply sew a quick one together. 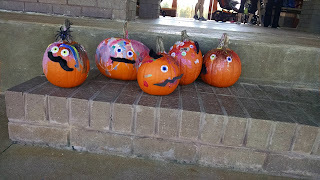 Above are the ones I made for my kids last year. 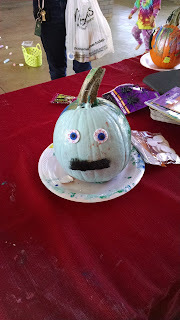 Use the same concept as the pumpkin decorating and make it potluck! Everyone can bring something different to decorate their bag with. You can write your kid’s name in spooky lettering too! 6. Boo at the ZOO! Most local zoos put on a Boo At the Zoo for the months of September and October. You can take your kids to partake in Halloween festivities while enjoying a fun time at the zoo! Make it a playdate! Local Boo at the Zoo! Hopefully these ideas are fun and easy ways to get you in the fall mood! Enjoy!